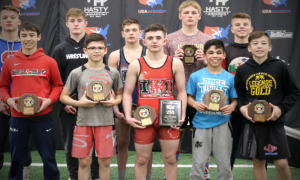 Part II of our 2018 UWW Junior Greco-Roman Nationals watchlist picks up where Part I leaves off beginning with 72 kilograms. The reason why we did not split the scouting reports into two articles consisting of five weight classes is due to the scope of participation. The first four weights feature, by and large, a higher number of competitors (with the exception of 130 kg, which is loaded). Just as a means to make this all readable and quicker-paced, jumping from four to six seemed like the right call, and hopefully that’s how it works out. Lenny Merkin (Princeton WC) — The last time we saw Merkin wrestle Greco he was busy giving Alex Sancho (NYAC) a surprisingly difficult go of it in the U23 Trials semifinal. But he was good before that. Merkin has always been an entertaining athlete to check out. He doesn’t play the passive game and because he’s so explosive, he can find scores from unconventional positions more upright competitors have a tendency to let slip away. Merkin also got some work in at the Junior Pan Ams last year, snagging a watershed international medal. Will be tough to beat. Calvin Germinaro (NMU/OTS-Minnesota Storm) — Germinaro wrongfully flew under the radar a little bit entering his first year in Marquette. The argument could be made that he was one of NMU’s biggest acquisitions, and that’s counting Benji Peak (60 kg), Britton Holmes (67 kg), and Carter Nielsen (82 kg). 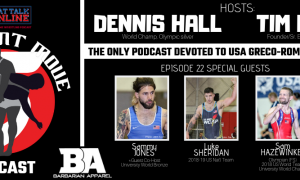 There weren’t any major breakthroughs during his first year of full-time training, and as such, guys who snared international medals received higher billing. But when you take into account Germinaro’s extensive age-group experience, his physical approach, and the environment in which he trains, you’d have to automatically figure he’ll contend for a spot in the finals. Tyler Eischens (Pinnacle) — Yep, here we go again, one more Minnesota kid who cut his teeth bombing heads on the youth level. Eischens is widely known for the good work he has put in at traditional stops like the Duals, where he could rely on his upper-tier athleticism and crisp technical acuity to make mincemeat out of lesser foes. Because he’s so well-schooled, you really don’t worry so much about Eischens not being a full-timer. He’s so adaptable and aggressive that no matter what style he’s wrestling, he’s bound to be successful. Tyler Dow (Badger RTC) — Coveted by many coaches across the country is Dow. He is the prototype. Hard as nails, on-and-off dominance in the international styles, an impressive scholastic resume, and he’s also got that whole Wisconsin thing going for him. Guys like Merkin and Germinaro are easy to latch onto primarily due to their most recent exploits, but Dow is more than capable of steamrolling his way into the argument and the smart money says that’s what happens. Adam Santoro (NYAC/FLWC) — One of Ithaca’s newer prospects, Santoro is a lot like most at the Junior Nationals. 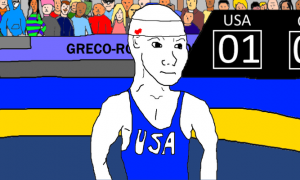 Greco isn’t his one true love, at least not yet, but since he can pretty much assimilate into any competitive format, opponents will find him problematic. Anthony Mantanona (Oklahoma RTC) — Everyone has gotten a taste of California kid Mantanona at Fargo, where he broke through in 2016 with one of the standout performances of the tournament. UWW competition presents some differences — not a ton — but enough to figure that a handful of Mantanona’s folkstyle tendencies could be exploited. Hips-out attacks won’t fly the same way they do in the Fargodome, a lesson many are likely to learn quickly especially with UWW’s new emphasis on perceived “negative wrestling.” Nevertheless, Mantanona is a thoroughbred possessing dynamite in those legs and hips. Provided he plays a tactical yet forward-pushing game, look out. Josh Anderson (NMU/OTS) — Missing pieces are best left to conjecture and coach-speak. Whatever it is Anderson might currently lack is not readily discernible to casuals, and that’s not a bad thing. Strong as an ox with a lot of reserves available in his lungs, Anderson is at his most effective when he walks the line between being an outright attacker and a breaker (one who wears opponents down by any means necessary). Not counting the Kamal Bey‘s of the world, no one at 77 is going to have the same breadth of intricate Greco knowledge as Anderson, but he has to do something with that. 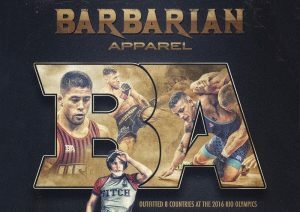 Jake Hendricks (X-Calibur) — A Cadet World Teamer in ’17, Hendricks didn’t advance at the World Championships, though he did get two matches in with one being in the repechage. The greatest compliment you can give to him is that the losses aren’t what mattered, you just wanted to see Hendricks get another shot because he looked like he was close to figuring it out. 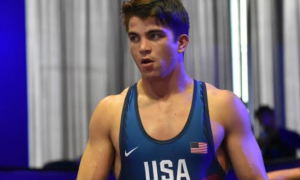 Assuming he took some lessons from Athens home with him, Hendricks has more than enough potential to be a very serious and successful Greco competitor both in the near future and beyond. 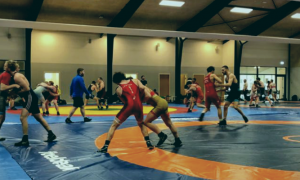 Tommy Brackett (NMU/OTS/Wave) — There are absolutely no gimmes or givens at the UWW Junior Greco-Roman Nationals, so to try and presume Brackett is a shoo-in finalist is a bit of a stretch. Particularly here at 82, since there are two other athletes everyone should also be zeroing in on. But we also can’t kid ourselves, either. Brackett boasts a level of competitive maturity that is rare when it comes to this style. He understands the importance of position and doggedly fights to get to where he needs to be. Brackett’s enthusiasm and significant amount of foreign experience are polished arrows in his quiver, as well. Difficult not to see him as a premier favorite. 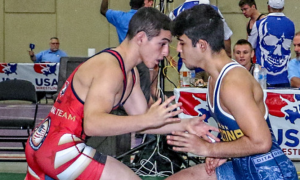 Andrew Berreyesa (NYAC/FLWC) — A Fargo champ for the first time in ’17, Berreyesa deserves to be recognized in the same breath as Brackett and the young man below. Brackett did get past Berreyesa in the U23 Trials via tech, but it’s probably a good idea not to take too much from that bout. Everyone has changed, everyone has improved. Berreyesa is a remarkably-skilled hand-fighter for his age and very well could be the smartest Greco strategist at 82. If he can’t force a position, what he can do is make opponents hesitate, and that is when he is apt to open up his offense. A real-deal talent who checks all the boxes. Tommy Dantzler (Front Range Twisters) — Dantzler is one of the top-three all-around best athletes who will be in Vegas, at Junior and at Senior. That does not automatically catapult him into the discussion in regards to Brackett and Berreyesa. There is work to do before that happens. He might have DNA on his side, but Dantzler is currently without the same overseas education others are accustomed to. How much that winds up playing a role is unknown, but it could if scores are close and time is precious. The legitimate firepower he wields and steely confidence that resides within him will be his primary weapons. One way or another, Dantzler is going to open your eyes. Spencer Woods (NMU/OTS) — Woods is a question mark at Junior, and that is not uncommon for Northern guys who didn’t light it up prior to college. All of the things Woods is beginning to do well are much more appropriate for the Senior level than Junior, where the action is all over the place and wrestlers with less relevant experience refuse to adhere to the stringent positional protocols more commonly found internationally. So no, Woods is not going to stop on a dime, buck his hips to outer space, and then go for something crazy. It’s not his wheelhouse. If he can control the pace and make guys start hanging onto him, he’ll be there to deliver them into the sweet good night. Chad Porter (ASU) — A verifiable beast. Porter is a collegiate folkstyle-type who you’ll watch and then slip into daydream-land imagining what he’d be able to do if he practiced throwing people around as a vocation. No, it’s not as if his credential sheet is 90 pages long and there are a bunch of Fargo plaques he comes home to. Ignore all that. Porter has, at least in the past, shown himself to be a hungry scorer with big-time power most part-timers simply don’t have. Keaton Fanning (NMU/OTS) — Maybe now. Maybe. There are plenty of solid reasons to see Mr. Fanning as a legitimate contender for a Junior World spot in 2018 but it’s this first step that will be his toughest by far. In fact, Fanning, as we have alluded to with some others here, would be looked at even more favorably if this was a foreign tournament. When Fanning blossoms into a Senior, he will take his place as one of the nation’s best eventually. That will have to wait. For as great of a prospect as Fanning is, avoiding the weird issues folkstyle-Greco-hybrids present should be his most pressing priority. Nicholas Casperson (LOG) — Still in the early stages of development is Casperson but he’s also in the right training environment to speed that process along. Has performed overseas and the tutelage he gained across the Atlantic instantly puts him in a different league than most. But does Casperson have the wherewithal to effectively deal with some of the more mature body types he’ll see in Vegas? Time will tell, but could be a sleeper. Anthony Riopelle (NMU/OTS) — Ropelle has been at Northern long enough now to have built himself a considerable arsenal that includes one of the best pound-for-pound arm throws in the US. And due to his participation in that program, he has also competed in plenty of foreign events, which if you can detect a pattern here, immediately gives him a leg up on the rest of this field. Riopelle has yet to make a Team, although he did come semi-close at U23’s before former teammate Blake Smith downed him in two straight. Provided he will be able to dictate the tempo and not be hamstrung by overzealous officiating, there is every reason to see Riopelle as a top contender. Hunter DeJong (MWC) — As is the case with most of the MWC registrants, DeJong is a smooth, transitional athlete who can switch from one attack to another seamlessly. He’s had good moments at some of the marquee domestic age-group tournaments before, such as Northern Plains and the like. On video it is easy to see that he is going to grow into a more formidable figure to deal with down the road. Par terre is the equalizer. They work on that in Nebraska, so if DeJong is able to defend others’ chances, and take advantage of his own, he should advance. Austin Harris (Cowboy WC/TMWC) — Harris is the man everyone in this weight class is paying attention to. Just a fact of life. Practitioners of all three styles can go one way or the other at an event like this. Harris will go the good way, lack of a better term. 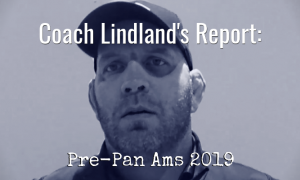 He does not have the Greco expertise of someone like Riopelle or the innate fluidity of DeJong, but he is more well-rounded than both and a physical specimen on top of it. Harris swoops in here as an imposing presence who will be looking to scramble his way to victory, which just might happen if he’s not treated as a very real threat. Cohlton Schultz (NYAC) — Anything other than a Schultz victory in the Junior tournament would be a huge upset. So yeah, let’s get that out of the way. The 2017 Cadet World Champion stomped through his folkstyle season, barely took a breather, and then dominated at the Austrian Open. 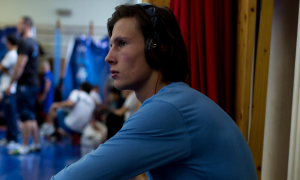 Following that gold, Schultz went over to Sweden for a training camp where he hung in there with 2012 Olympic bronze Johan Euren (SWE) in an exhibition match. That’s what this kid has been up to. No one is unbeatable, but yikes. Nick Boykin (Sunkist) — Still considered an elite heavyweight prospect, Boykin has enjoyed the benefit of a lot of activity this season with trips to Sweden, Cuba, and wherever else. Unlike Schultz, who appears to be much more of a polished product with the medals to prove it, you really shouldn’t get too carried away with results when it comes to Boykin. Right now, it is much more important for him to further mold his style and learn how to make the most out of his height disadvantage when battling taller bruisers. It doesn’t seem like an important point, but with heavyweights, length matters a whole lot more than it does in other weight classes. Boykin is too good to commit newbie errors at this stage and few control tie-ups with more oomph. A lot to look forward to with this athlete. Brandon Metz (Bison WC) — It’s not the easiest thing in the world to get Metz’s last-second Fargo final loss to Anthony Cassioppi (Ill) out of your head probably. That was a summer ago. Metz has moved on. He has grown, physically, mentally, metaphorically. A lot of folks see in Metz the kind of attributes a promising heavyweight should have. He’s got a big, strong body. He’s explosive, agile. And he also comes equipped with a lot of age-group success going back several years. Tommy Helton (Southern Illinois RTC) — Helton knows Metz fairly well. The two met in the Fargo Junior finals in ’16 with Metz emerging victorious via fall. And no, you shouldn’t just go and pretend like that never happened, but does it make a difference in 2018? Certainly not. Helton became one of the rocks of the vast Illinois program because he always came to fight, regardless of the circumstances. It’s an approach that never leaves. So while he has spent time in folkstyle more recently, you’re banking on Helton demonstrating new skills to go along with his patented feistiness. Be pumped you’re seeing him at this tourney.